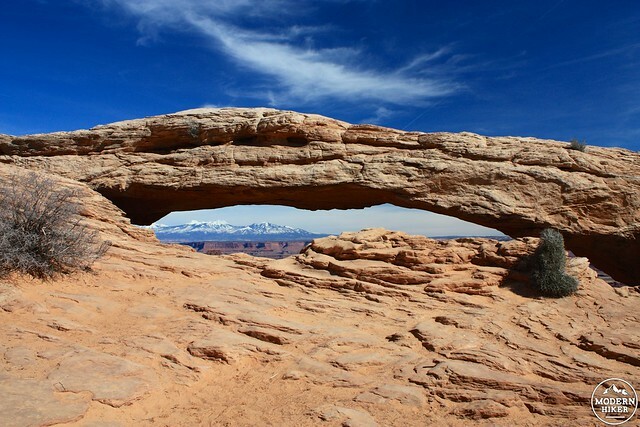 Mesa Arch is, undeniably, one of the spotlight attractions in the Island in the Sky District of Canyonlands National Park. Like, say, Yosemite’s Bridalveil Falls, it’s off the main road and a short, easy hike – but its ease of access should not deter you from visiting – even if you see a bunch of cars at the trailhead. 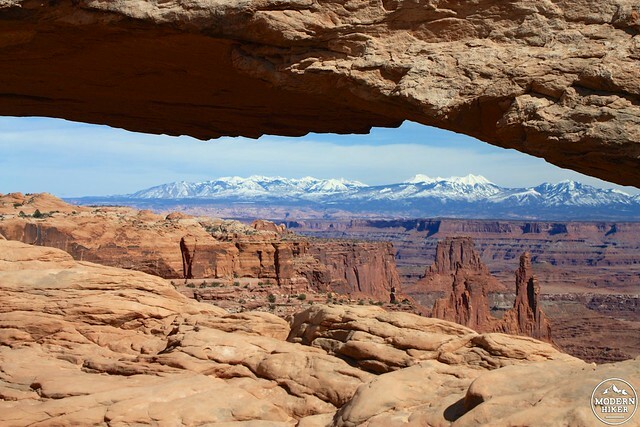 The Canyonlands National Park web site describes the Mesa Arch Trail as a “mild walk,” and that’s pretty much what you’ll get on this very short loop. The Park Service clocks this at 0.5 miles round trip while my GPS gave it a slightly longer 0.7 (maybe because the official trail doesn’t actually go out to the Arch itself). 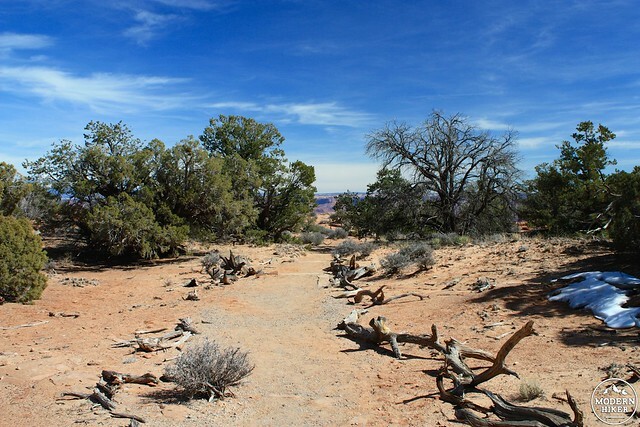 Either way, this is an easy and simple hike that can be done on the way to a longer trail or – as I did – on a first-day recon of the park itself. Because this is one of the most popular trails in the park, the parking area at the trailhead is spacious and the signs for the trail itself are very, very well marked. 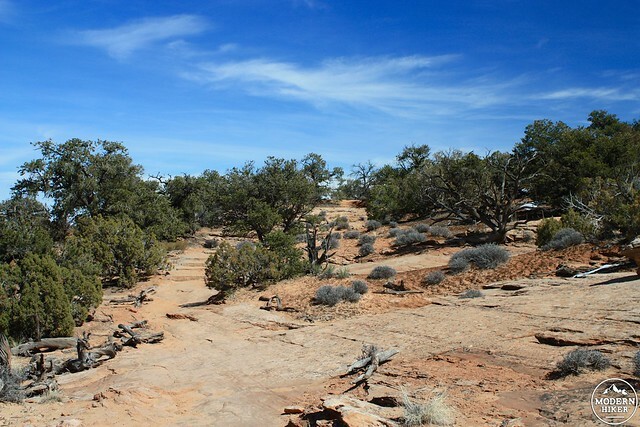 This loop travels across slickrock and dirt, but unlike other slickrock trails which are usually only marked by stone cairns, this trail has a fairly easy to spot path along it’s entire route. You’ll see stairs carved into the stone and the trail hemmed in by desert driftwood – very, very difficult to get lost on this one. Underfoot is a less visually striking but still impressive desert feature: cryptobiotic soil. This muddy-looking rippled landscape is not dirt, but a complex ecosystem of lichens, mosses, bacteria, algae, and cyanobacteria – one of the world’s oldest known forms of life. 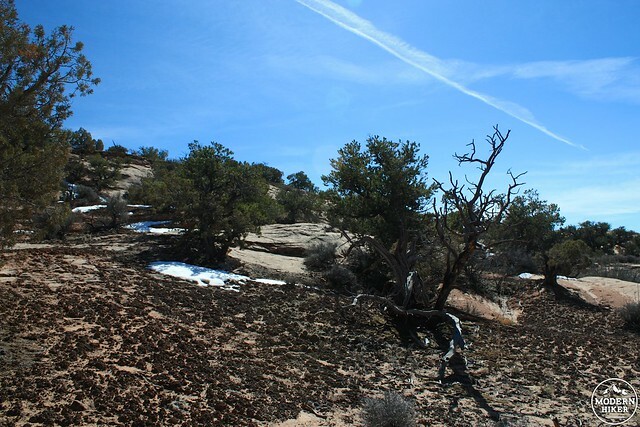 On those rare occasions when the high desert gets wet, the cryptobiotic soil grows through the loose surrounding soil, holding rocks and sand together and creating a stable layer of topsoil for other plants. In addition to fighting erosion, this system of organisms also helps to retain moisture in the ground and fix nitrogen from the air into the soil. This dull-looking dirt is actually the foundation for most of the plant life here on the high desert of the Colorado Plateau, and if you do any traveling in the area you’ll not only become accustomed to seeing it, but you’ll also learn just how fragile it is – the damage done from a single footstep on cryptobiotic soil can take more than 50 years to repair – so please, stay on the trail. The trail rises over a low hill and you’ll immediately begin to see some phenomenal views looking east toward the Colorado River. 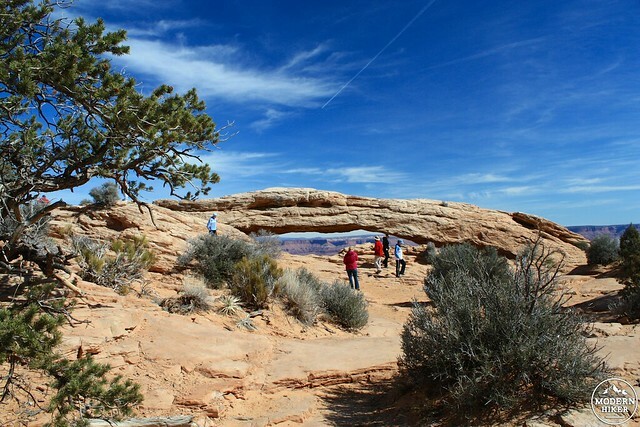 As you approach, you may not be able to immediately see the low sloped arch – but you’ll probably notice people setting up their cameras and posing for photos. 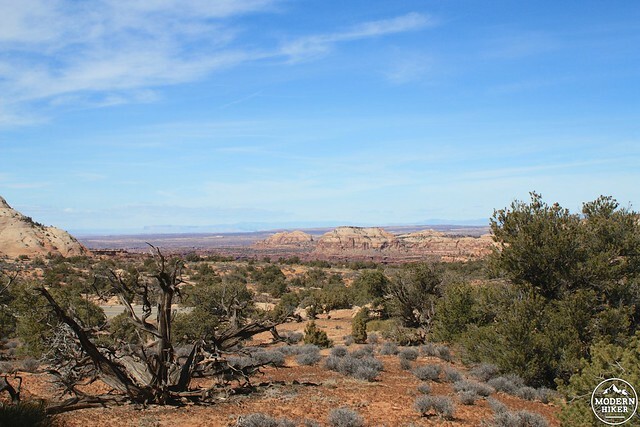 Soon, you’ll see Mesa Arch perfectly framing a set of snow-capped mountains in the distance. When you’re done soaking in the view, return back to the trailhead to complete the loop. Because of its east-facing window, Mesa Arch is a very popular place to watch the sunrise and it’s easy to see why. A simple Google Image search will net you hundreds of drop-dead gorgeous sunrise images … so if you want to add your own to the mix be sure to get to the Arch plenty early! Excellent. 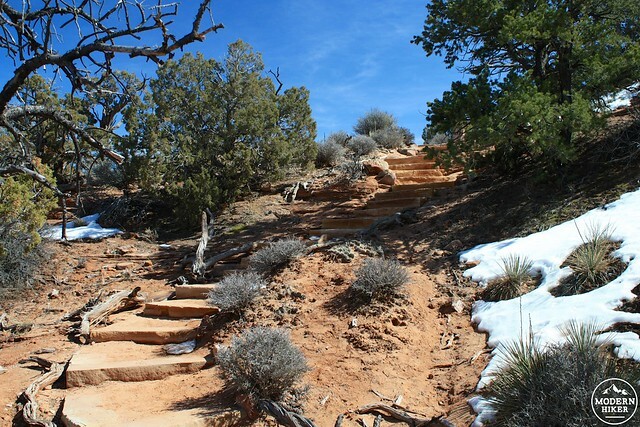 This is one of the easiest and most popular trails in the park. The trailhead is 38.5 miles from Moab. Head north on US 191 for 11 miles and turn onto UT-313 West for 14.6 miles. 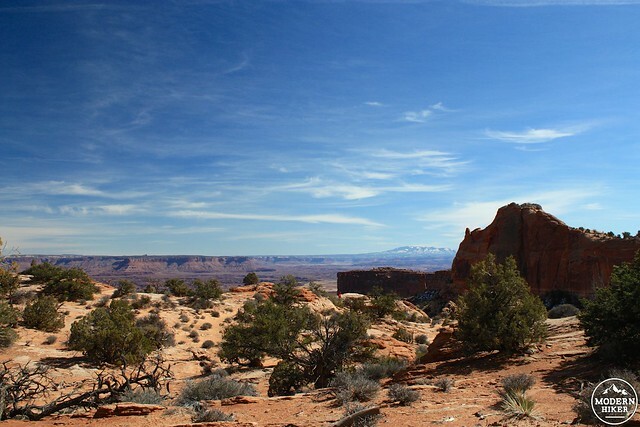 Stay straight to continue onto Grand View Point / Island in the Sky Road and enter Canyonlands National Park. The trailhead is near a small parking lot on the left hand side of the road in 12.9 miles.